Ohkay so, this episode of Balaa was alright. I will say that even though I know things & characters are being like this for a reason but I am not too happy about it because everything is a bit too typical & I am not liking the scenario. Yes, the story will progress this way only for Nigar’s real face to come through later & the writer is showcasing the reality with some people being too simple minded & others being too manipulative but still, I wasn’t too impressed with this episode of Balaa. So, Shama came to a conclusion that there was only one way Taimoor’s broken heart could be mended & that was marriage – that too with a girl who loved him. Yes, Shama’s perspective can be deemed right, she wants her son to move on & get distracted from what happened & she thinks Nigar is the right choice but to literally sacrifice her own daughter for that matter is ridiculous. Yes, Shama is simple-minded, she believes in seeing good in people but to literally ignore & forget about the nature & behaviour of people like Zafar is not innocence, it is stupidity. Shama can do all that she wants for Taimoor but to see her pushing the idea of Batool getting married to Junaid was upsetting to say the least. Shama can wish for happiness for Taimoor but she should be wise enough to know that Zafar is a very difficult person to be with so how can she put Batool in such a situation where she’d have to deal with Zafar on a daily basis. Yes, it is good that Shama wants to hold onto her relations & wants her children to do the same but I don’t think any mother is so blind to her children’s wish that she puts someone else’s happiness ahead of her own daughter’s. Nigaar continued to weave trap around Shama & Taimoor quite tactfully. With Shama Nigar didn’t have to do much work but she kept on hovering around Taimoor trying to prove her love to him. To be honest, I kind of laughed when I heard Taimoor agreeing to get married to Nigar, like he couldn’t even stand her a few months back & now he acted like aik chai ki maar who just accepted Nigar seeing how keen she was to be a part of his life. Yes, Shama & Zafar’s brainwashing did work too but Taimoor accepted Nigar because he wanted to & because he liked the idea of being with someone who loved him more. Junaid created a scene in front of everyone & I was amazed that a God-fearing woman like Shama didn’t deem it odd that Junaid was an alcoholic & in fact she still advocated Junaid in front of Batool saying that he will get over alcohol as its just a phase that he is going through by relying on it to forget about Zeba. Even Saleha thought Junaid’s proposal wasn’t bad & all of this was happening while everyone pretty much saw that Batool did not approve of this & she didn’t like Junaid to begin with. Taimoor did say that he will support Batool’s decision of not getting married to Junaid but I am sure he will succumb to Nigar’s pressures & even Batool will give in. Overall, this episode of Balaa was just alright because I was not too impressed with Shama & her sensibility as a mother. As far as Shama’s concerns for Taimoor were concerned they were genuine but when it came to Batool it was too obvious that she was ready to sacrifice her daughter for the sake of Zafar & Junaid’s happiness by wanting Batool to mend his broken heart exactly the way Nigar would do for Taimoor. 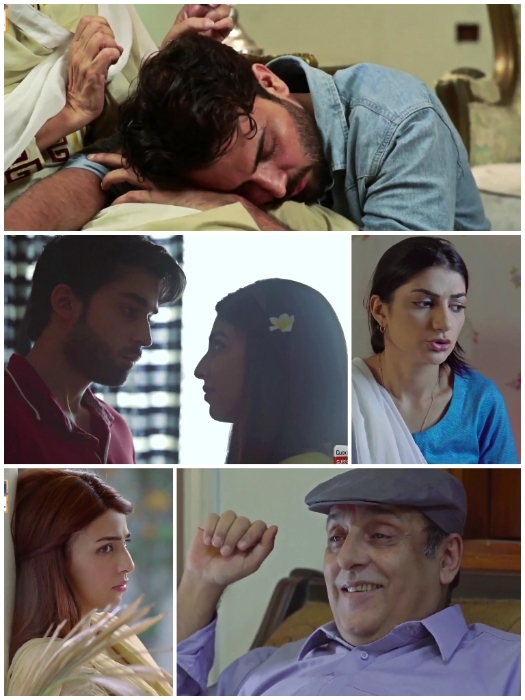 The acting of all the actors is definitely amazing & the actress playing the role of Batool stands out again. She is effortless & a fine actor. Please share your thoughts about this episode of Balaa.